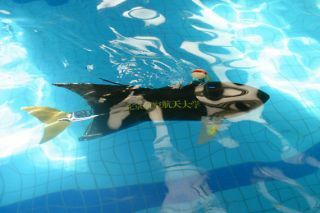 The black-bodied robot fish is about four feet long, and resembles a real fish in both shape and movement. The robot is controlled remotely with a palm-sized control pad. It also has automatic navigation controls and swims at about four kilometers per hour for up to three hours. The robofish from China is described as being "flexible in action, easy to operate and makes little disturbance to surrounding environment." It has been tested in an underwater search of a sunken warship last August. If you like robofish, you might want a look at robotic lamprey parasites. Learn more about the real Titan (as opposed to the literary version). Read more about the underwater robotic fish.